Ive tried google etc but not a lot comes up so could anyone suggest walks around Bellochantuy? I am staying there for a week soon so i am looking for forest trail type walks around there. 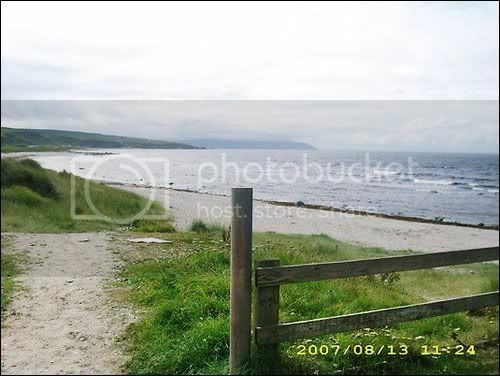 Part of the Kintyre Way comes into Bellochantuy. It's a spur off the Carradale to Campbeltown section. Go to the Campbeltown Information centre by the harbour.Very helpful in there and they have loads of maps.Carradale area has some good walks.I would also suggest buying O.S.maps of the area.Enjoy your stay! Just about quarter of a mile north of Bellochantuy is a forest road which takes you over the hill to the Lussa Loch, then branches off. To the left takes you up to the wind farm site and on to Carradale. Going right takes you round the West side of the Lussa and back to Campbeltown. Their are various other trails but it depends on how far you want to walk, it can be a fair treck. Better to bring a mountain bike or hire one for a few days, (you can get them locally) it would open up a huge range of tracks if you have time. Incidentally the road over the hill at Bellochantuy is used by forestry and wind farm traffic. Thanks all for the suggestions. I will give the tourist information centre a try when i get there. When did they put a wind farm at Carradale? I don't remember seeing it the last time i was down although i didn't do much walking then as i was a heavy smoker. Ye wull be walkin a hell o lang time roon Carradle afore ye fun a wind ferm there ma sowel ! unless its the blast o breath oot o Morenish yer seekin. Jist try atop the hills in the middle atween Bellochantuy an the village an ye'll hae mair luck. Where does the forest road from Saddell end up? I took a walk up part of it two years ago and i thought it looked like it was heading towards Bellochantuy. I may bring a mountain bike with me this time as i would quite fancy trying a run like that. I was talking mince about the route from Bellochantuy, i was getting mixed up with the route from Killean (Tayinloan) taking you to Carradale, the route i told you of does in fact take you out above Ifferdale in Saddell. The Ifferdale road connects to the Kintyre way and comes back to the Lussa Loch past the old outdoor centre of Bord a Dubh. Try this http://www.forestry.gov.uk.Search for area,then click on walks. This is a photo of the beach from the Caravansite just along from the Hotel. You can walk from the hotel to the caravansite on the beach. 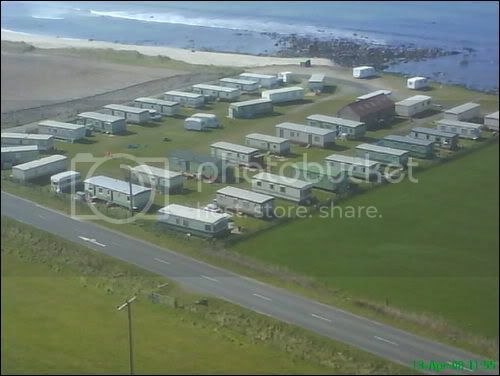 This is a picture of the Caravansite from the hill across the road. Worth taking a wee walk along. I took a walk along the bit you took the picture of the caravan site and I got a couple of pictures on my travels. I found a fantastic walk up the road i think leads to the wind farm with some great views at the start as you head up the hill. Lovely photos Scorpion, brings back some great memories. Love your dog by the way.